Birthday Meal at the Muse - I stress it was my 40th, not these two! This is a blog entry I have been meaning to write for a while, but I kept putting it off. I’m not certain if that means that I’m in denial about the ageing process, or if it just means that I have been silly mad busy over the last two months. I’ll stick with the latter for now. I know that a 40th was the first significant birthday of my parents that I remember! Significant birthdays become a problem for me, ever since my 30th. Being born on September 11 means that you share the birthday with one of the worst terrorist atrocities ever committed. As I was born in 1971, it means that Al Qaeda’s attack on the twin towers will always have a significant anniversary when I have a significant birthday. 9/11 will always cast a shadow. Putting that aside, it is fair to say that both my 30th and 40th birthdays were great fun, in no small measure because of Jill. She’s great at plotting and scheming very memorable events. My 40th celebrations were spread over a full month, and the final event was a complete surprise. My parents came over to visit a few days before my birthday as my birthday-weekend had become quite complicated due to the fact that some close friends were getting married on Saturday the 10th (Hi Katrina and Tom!) and I had agreed to be the photographer for them. This ruled out any idea of a weekend away from home. The weather was fantastic, and we had a great time. There was a creché for the children during the wedding breakfast so we had somewhere that Nathan and Aidan could stay while I took pictures. Jill had also arranged the wedding cake through her sister Paula, who is superb at such things. Of course, that is to be expected as Paula is a chef in her day job. A great day, with a wonderful couple. 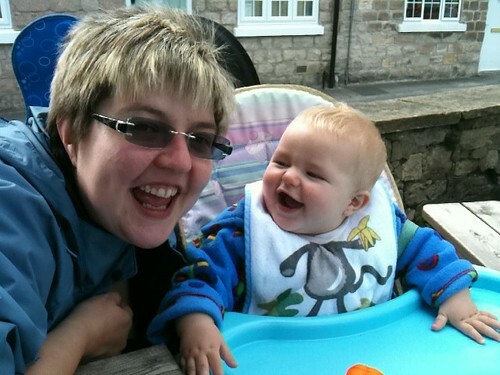 Paula and her fiancé Mark had decided to use the trip to Yorkshire to have a small break and they offered to take Nathan with them for a treat. So he disappeared off on Saturday night, leaving Jill, myself and Aidan to our own devices. As a result, the day of my birthday was quite lazy. We had a very relaxed meal at a local bar restaurant called ‘the Muse’. Aidan was very entertaining as he kept on trying to steal my beer. It’s a habit he shares with his older brother. 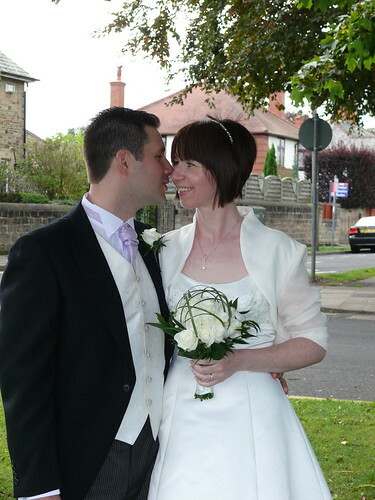 We had cake and party tea when Paula and Mark returned to Wetherby. As I mentioned in a previous blog post, I got a wonderful gadget from my birthday, an Amazon Kindle, from my parents. I love reading, always have, hopefully always will and this is really to carry a lot of books out around at once. It’s perfect for holidays especially with sunshine. The Kindle app on the iPad is good, but doesn’t really work in bright light. However it definitely has the edge in the darkness thanks to the backlighting. The only thing the Kindle is missing is the tactile experience of the book as an artefact. Jill’s presents to me were experiences rather than gadgets, books or other media. The first was a couple weeks later with a visit to Centre Parcs at Sherwood where we met up with some old university friends of mine; Ceri, Nick and their Daughter Nia, and Jon & Becky. We went there for a long weekend as there is plenty to entertain the kids. Highlights included my birthday meal as Jill had booked it like a children’s party but with the option of cocktails (Mojitos! ), a badminton match between Jon and myself, and a fantastic afternoon at the spa for Jill and I to relax and chill out without the boys. All in all, we had a brilliant time. The final surprise was possibly the most memorable as I wasn’t expecting it at all. I’ve long been a fan of John le Carré, and Jill had outdone herself by having the small local cinema in Wetherby for a private showing of “Tinker, Tailor, Soldier, Spy”. By “private” I mean the two of us and some close friends. This included my parents and some family friends who had travelled across from Cheshire, plus people from work, the church, and gaming. It was a wonderful experience. The cinema is pretty small and it is of an old-style. But, in reality, it was perfect. The people running the Wetherby Cinema were very welcoming, and even gave us an option of whether we wanted an interval or to run straight through. Unsurprisingly, we opted for an interval with ice creams. (*)And, in the light of the weekend’s news of the death of a family friend far too young from cancer, this means more to me than ever. I've always been deeply sceptical about the utility of voice recognition software. There's always seem to be so much that was a pipe dream about it. The background noise, differences in the user's voices and many other complications such as processing power all combine to make it very difficult thing to do. My scepticism weakened a little when I tried the free Dragon Dictation application for the iPhone. Although the processing for this was done via the Cloud, the results were deeply impressive when I tried it. Apple's Siri voice detection system and personal assistant also showed great promise. So when I heard that Dragon had released a new application by the App Store, called Dragon Express, which mirrored the iPhone application using local processing I couldn't resist trying it. I'm dictating this using the internal microphone on my MacBook. There is a stage of about 2 min of training for Dragon Express it adjusts to my voice, the microphone, and the typical background noise. The accuracy of the voice recognition is quite impressive. You do have to speak slowly and clearly, but that actually encourages you to think about what you are saying. If anything, it clarifies your thought processes. There have only been a few stumbles in translating what I've said. An example of that will be the word "free" which could get mistaken for the number "three". Indeed, I did have to manually alter that word to correct it. The software does suffer from the problem are shown by Isaac Asimov's "Second Foundation" scene involving Arkady where an entire conversation is inadvertently recorded for posterity. If you leave it open and running it will listen to you and assume you're talking to it. However, I could actually see a use for this. Maybe not when the children around, but now it's quite an evening with the kids in bed it means I can be quite lazy in preparing material. All in all, so far I'm impressed. Well done, Nuance, this could change the way I work.